In our last post, we discussed the definition of Engagement. One item we mentioned but didn’t answer was how to increase your members’ engagement. "Send more emails, hang more flyers, make more phone calls…" It seems like more is the new buzzword for internal marketing these days. Have you ever had a member say “I didn’t know about that", even though you sent them a half-dozen emails? Maybe the 7th email would have done the trick. No, probably not. The issue we have is that all of us, including our members, are overwhelmed with too much information. Sending more just adds to the overload. Instead, we need to focus on having effective communication. That is, sending the right message to the right person at the right time. I know, it’s easier said than done. GroupValet helps to increase awareness in two unique ways - by growing groups and by providing a platform for “engagement marketing". We’ve talked with many group captains and they’ve all told us virtually the same story. Their group grew to a certain size and that was enough work for them. Whether that was 12 people, 40 people or 60 people, at a certain point the group captain reached their capacity and could not spend any more time each week managing their group. So they stopped adding new members. When these groups started using GroupValet, a whopping 90% got larger within the first month. It was common to see growth of 50-80%, with many groups more than doubling in size. When we asked the group captains about this growth they all had the same explanation. Before using GroupValet they would limit their group members because of how much work was involved. Once they started using GroupValet and realized how dramatically reduced their workload was, they were happy to let more people into their groups. The use of GroupValet got more members into these groups, which directly led to the members having more awareness of what was going on each week. “What is Engagement Marketing", you say? It’s the most effective and hyperlocal type of marketing there is. In GroupValet, you’re able to market your organization’s important events and messages directly into the engagement vehicles your members are already using. Let me explain. In GroupValet your members create and join groups. These groups receive automated email notices about signing up for their activities - see above. The members quickly learn to expect these emails and open them at a very high rate. Within these emails, the club has access to place a custom banner ad that can be targeted. So if there’s a golf group that receives their weekly emails about signing up for their golf game, you can put a banner ad for the upcoming Member Guest Tournament. This is extra awareness without needing to send an extra notice - the members will receive it directly in the notice they are already waiting for. And you’re able to target certain ads to certain types of members, such as “men receiving a golf email" or “women receiving a tennis email". Best of all, your ad can link directly over to your event, so if you manage that event in GroupValet it can link members right to the sign up page for that event. Talk about getting the right message to the right person at the right time! It almost goes without saying that if you’re able to increase awareness, you’ll increase participation - and I emphasize almost. You can have the most effective marketing campaign for golf events, but if a member doesn’t care about golf they are not going to participate. So it’s up to the club to determine what interests the members have and then create experiences around those interests, right? Well…no, not really. After all, who has the time? Clubs and Associations have become very good at organizing the standard types of activities their members typically enjoy - golf, tennis, cards, book clubs, wine clubs, pickleball, bocce and the like. But the fact is there are many other interests and passions your members have. There’s no way you could think of them all, much less organize them all. So why not let your members do it themselves? GroupValet has the option to allow members to create their own groups for virtually any interest. We’ve seen members create activities for bird watching, film clubs, fly-fishing, ski trips, music, knitting, croquet, running, biking, networking, cocktail hours, gardening, pottery, cooking and day trips, just to name a few. When you allow members to create, organize and manage their own groups based on their own interests, you’ll see participation flourishing throughout the club. But you might worry that all this extra activity will mean extra workload for your staff having to manage the rooms and amenities. Not to worry - GroupValet can handle that too. Just set up the rooms and amenities to be booked through GroupValet and the group captains can easily take care of that themselves. Your staff will still be in the know - they just won’t be in the trenches. This is the hardest pillar to achieve because, at least to a certain extent, you have the least amount of control over this one. But if you’ve done everything you can to make sure members are properly aware of activities (sending the right message to the right person at the right time) and you’ve provided the platform for members to increase their participation, then you might be closer than you think. What are members looking for from the club? Personalized service. This starts with greeting the members by name, but goes much deeper. Members don’t want to log into a website or app to see a bunch of activities and events they don’t care about. They want a personalized view that shows them everything that they want to know about. They want the GroupValet Dashboard. We’ve done the hard part for you. When members go to GroupValet, they see all their upcoming activities - golf, tennis, cards, committee meetings, book clubs, poker - all personalized for them. If they don’t play canasta, they won’t see canasta. Instead, they will get a simple view of their group and club activities - all in one place, organized and easy to get through. If you really want to delight your members, this is how you do it. 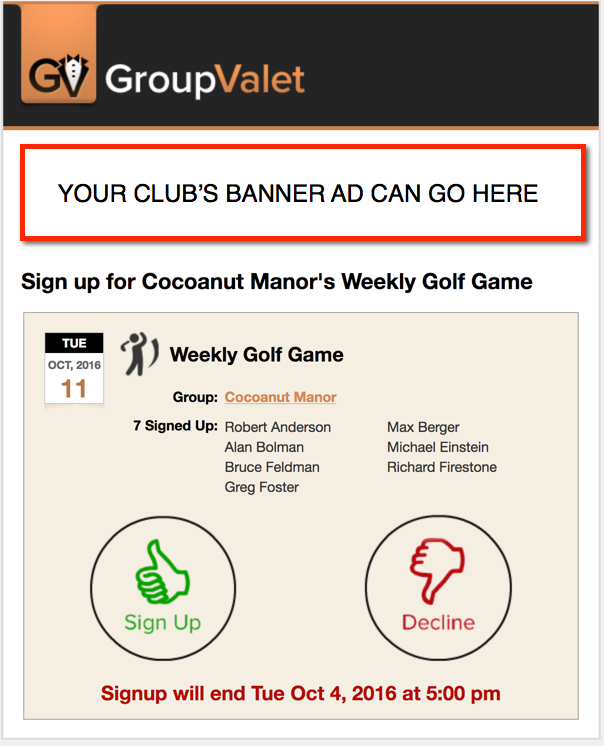 GroupValet was built from the group up to support the Three Pillars of Member Engagement, and to help you achieve greater engagement throughout your club. For more information, visit www.groupvalet.com.